Following the expected clearance of the Thermal Protection System (TPS) – which was re-checked during Late Inspections, along with the successful checkouts of the systems the orbiter will use to carry her crew back to Earth – Atlantis is in the final hours of orbiting the planet, ahead of an expected early morning landing at the Kennedy Space Center (KSC) on Thursday. For Wednesday, Atlantis’ crew conducted a pre-programmed series of tests on the vehicle’s Flight Control Surfaces (FCSs) to ensure that they can attain the necessary positions for a nominal reentry profile. APU-1 (Auxiliary Power Unit) was used to power the hydraulic systems, as Atlantis flapped her wings one final time on orbit, accompanied by the usual couple of pieces of liberating debris – otherwise known as pieces of ice, which can build up on the orbiter during their travels in the cold of space. “FCS C/O was performed with APU/HYD System 1. The FCS C/O was nominal. Flight Controls is GO for Entry Ops: All APU 1 parameters were nominal during the FCS checkout run,” noted the Mission Evaluation Room (MER) via update presentations (L2). “APU 1 start occurred at 201:05:16:36. The APU 1 FCS C/O run duration was 4 minutes 26 seconds, with shutdown at 201:05:21:02. Due to the short APU runtime, APU lube oil spray cooling was not required. The maximum APU lube oil outlet temperature was 206 degrees F and the maximum oil return temperature (WSB out temp) post APU shutdown was 191 degrees F.
Additionally, the crew conducted a “hot fire” test of Atlantis’ RCS (Reaction Control System) thrusters. 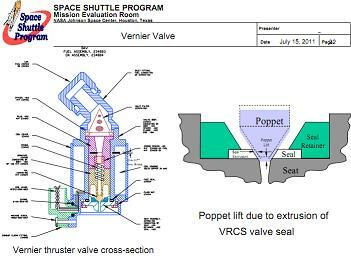 These thrusters will be used during the initial periods of Atlantis’ reentry profile to maintain proper vehicle attitude until enough atmospheric pressure will allow the FCSs to take control of the orbiter’s attitude commanding. As expected, no issues were recorded with the L5L vernier jet, which had previously been noted as suffering from a minor pressure drop. Even if this thruster had failed, there would have been no mission impact as a result. The unsung heroes of orbiter safety since Return To Flight (RTF) – the Damage Assessment Team (DAT) – also wrapped up their work with the mission by evaluating the Late Inspection imagery. 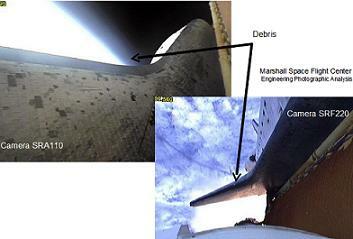 As expected, they found no items of concern with Atlantis’ heatshield. “The mission continues to proceed nominally. RCC (Reinforced Carbon Carbon) Level 2 imagery screening was completed overnight with no major issues identified,” noted the NASA Test Director (NTD) report (L2), prior to a peer review which allowed the Mission Management Team (MMT) to clear Atlantis for the return home. Interestingly, and in a sign of just how seriously the teams take the health of the orbiter’s TPS, the imagery team were tasked with an action to look into a debris event during launch – even after the orbiter was known to have suffered no damage – in order to determine if any noticeable events on camera footage correlated with the WLEIDS (Wing Leading Edge Impact Detection System) Case A1. That “Case A1” detection by the WLEIDS was not of any concern. However, imagery experts at the Marshall Space Flight Center (MSFC) appear to have found a match to the event which was registered at 109.6 seconds. Using footage taken from the cameras on the Solid Rocket Boosters (SRBs), a tiny piece of debris is seen “near” the starboard wing at 109.5 seconds, in the general location of the reported WLEIDS trigger. Although there is no conclusive impact of the debris, it is likely to be the cause of the trigger. 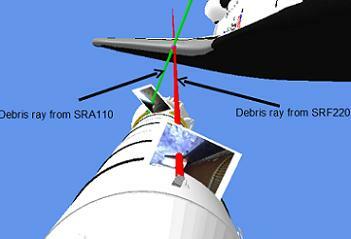 The debris is so small, it held no threat of carrying enough mass to cause even cosmetic damage to the RCC panel – which was of course confirmed by the Flight Day 2 Orbiter Boom Sensor System (OBSS) inspections of the Wing Leading Edges. A completely different debris event was also noticed during the Stage EVA – which was conducted during Atlantis stay at the International Space Station (ISS). “FOD (Foreign Object Debris) was seen by ground team members as it was leaving the payload bay during EVA1/FD5,” noted one MMT presentation (L2) on the observation. 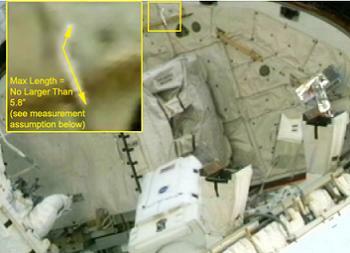 “SRMS (Shuttle Remote Manipulator System) elbow camera was the only recorded view. Teams were able to assess that the FOD was growing larger in the frame of the camera and increasing in speed. They were also able to confirm there wasn’t enough “signature” for item to be metallic. So a clean and highly reviewed Atlantis now spends her final hours on orbit, as preparations are made for the opening Orbit 200 option of conducting the deorbit burn and starting the trip back to the Kennedy Space Center to mark the end of the Space Shuttle Program (SSP). Another article will follow for the deorbit burn.